Cook like a professional. Prepare your own pizza dough. Place the flour in the bowl of a food mixer fitted with a dough attachment if you have one. Add the yeast, hand-hot water and salt. Switch on the machine and mix until you have a very sloppy dough. You can also do this by hand and mix with your fingers for 2-3 minutes, then knead to incorporate the flour, scraping the sides of the bowl and folding the dough over itself until it gathers into a rough mass. Turn the dough out on to a well floured surface; lightly flour your hands. Knead for 6-8 minutes until the dough is smooth and pliable. The dough will be very sticky at first; keep your hands and the work surface lightly floured, using a dough scraper if necessary to prevent it from sticking and building up on the work surface. 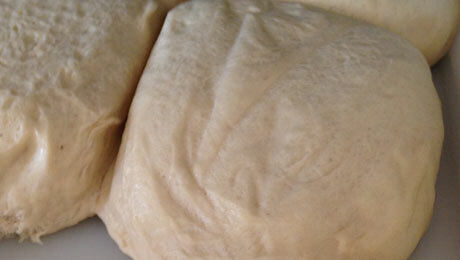 As you continue kneading, the dough will become more elastic and easier to handle. Shape into a loose ball, then return it to a clean bowl and cover with cling film. Leave to rest for 20 minutes. Turn the dough out again on to a well floured surface and knead for 2-3 minutes or until it becomes springy and very smooth. Shape into a loose ball and place it in a lightly oiled large bowl. Turn to coat the dough with the oil and cover tightly with cling film. Leave to rise at room temperature (75-77ºF) for 1 hour, or until it looks slightly puffy but has not doubled in size. Take your dough, roll it out into 12” disks, and add your toppings. If you have a friendly baker and can get hold of fresh yeast, simply replace the dried sachets with 25g/1oz. Place in a small bowl with two tablespoons of warm water (105-115ºF) and then stir with a fork until dissolved. Leave to stand for about 3 minutes before using.